I know that many, if not all of you have heard the above quote at one time, in one form or another. Today I heard this quote and it jolted me... I immediately went to the computer and pulled it up... 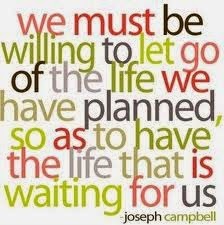 The quotes and life lessons from Joseph Campbell are incredible and thought provoking. One of the reasons I have had trouble moving on from 'him' was one, I love him with my whole heart and two, I feared what was out there for me. I remember a woman in her 40's over twenty years ago that I knew who desperately wanted to be married. She finally met and married a man; however he looked like he was old enough to be her father. I thought to myself at the time, wow... I don't want to get to my 40's being single and settling for a man who looked old enough to be my father... Then I heard that quote this morning and I was reminded that we all have a path we need to be on... That was her path and she was happy with her choice. My path will lead to my hearts desires and it won't be some old guy who has no desire to live a little... I'm the girl that needs excitement and fun. Also, just because I have let go of my past, it doesn't mean that it was wrong, it doesn't mean that it wasn't meant to be. What it means is that I have to trust that some amazing man is looking out there... looking for someone as amazing as me. If I don't know that I am amazing, how will any man know that.... my self esteem does not depend upon whether a man loves me or thinks I am amazing... My self worth comes from within.... I do get a little defeated when I keep meeting men that have qualities that are so far removed from what I am desiring... but as my sister said to me this morning.. move on and say 'next'... and never settle. I will never say it is easy moving on from a dream that you want and that you know would be wonderful... but I also know that not moving on is not an option for me. If a man cannot see how wonderful and worthy I am, then it is his loss... truthfully it is his loss even more than mine. I don't want to, nor will I settle for someone who would settle for so little in their life. I don't believe in fairy tales but I do believe in love... and deep down inside me that belief has held me together for the past eight months when all I wanted to do was curl up in a ball and cry non stop. It was and is a rough road, however; I know I will rise above all of this one day and look back... I might even wonder why I almost settled for so much less then I deserved. Amazing Quotes ,love especially the first one! I dated in my 30s--I found that when I wasn't ready to date and wasn't comfortable with myself, I attracted some strange men. The quality went way up later, once I knew who I was. I know part of it was simply the men I chose to even communicate with, but a large part of it was the vibe I was putting out in each case. Good for you, Launna. I happen to think you deserve a whole lot better than you've dated in the past. And you lost a man who couldn't appreciate you but "he" lost a woman who would have loved and cherished him. So the greater loss was his. BTW you were looking smokin' hot today, if I can say that without sounding like I've switched sides. And you looked more 'alive' than I've seen in a while. I think you have turned the corner. I'm excited to see what the future holds for you. 'Walk on Woman'! Some people stopp to much time on one problem, specially the love problem, but I think that its wrong, cause firstly we must love ourself and this love must be so strong that when we feeling sad about someone, this love can help us. Finally everything past, no moments es eternal, and we just have to be strong to fing love in our own heart! These are great, Launna, thank you so much for sharing. Amiga post ótimo amei bom final de semana. We are certain, given time and possibly patience too, that the right person will come along for you. And when he does you will be sure, and at that point everything else will fall into place or, as often happens, no longer matter. Meanwhile, take joy in this day. 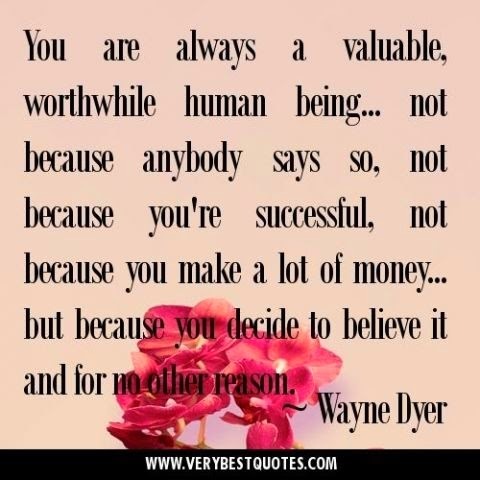 Great quotes, love that your self worth comes from within.Hope you have a great weekend. Great quotes! Have a lovely weekend Launna! You do sound like you are coming to grips with it all so that you can go on to find a man much better than you ever imagined. Just remember to keep your head up -- if you're feeling sad and looking down you might not see him! Such a wonderful quote Launna. Its definitely hard to find the perfect soul mate but you deserve nothing bu the best and it will come to you when it is meant to be. Aw Launna blessed your heart. I've been there, and before I met my husband, I only asked for the loving man who going to love me who I am, just like you said, you're amazing and a quality once, so we just need a man who fit into our darling sole. I am so willing to love, to care, to be a royal woman for him plus I am so easy to please, an easy to love, Me and my husband are still in love one and another even though we're together for so many years already, love never die. So are you launna, You're such a darling and one of quality woman.you just keep waiting and pray for the right man, a loving man he is going to love you with all his heart, keep praying for him, he's waiting to meet you somewhere out there. As we believe in love, we will find a true love:). which I always been thought and I myself strongly agreed the only inside beautiful can keep the good and quality man forever. My best goes to you Launna. Good night from me:). love!!! I believe that the things that happened in the past and that we sometimes might see as 'mistakes' are actually just meant to be. They are the things that has brought us to where we are now, to the life we live right now. And if that life is a happy one, then all those 'mistakes' from the past were actually blessings. Sometimes I think that I should risk and have a baby or it will never be the moment. How is going your weekend? You always find the best quotes. Although you may write about something different from what others are experiencing so of the same stuff applies to other aspects of our lives. Grandes palabras que motivan, saludos. We're fortunate to have writing to hold onto when everything else is lost. It's lead me straight when I've gone astray. That doesn't necessarily have anything to do with your post, but the fact that you posted. Keep writing. Amazing quotes! I dated after a really bad break-up. I found that when I wasn't ready to date and wasn't comfortable with myself, I attracted some strange men. It's always a pleasure to read your post, you find the best words that give me motivation!!! 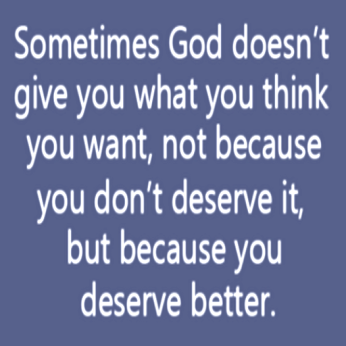 Moving on isen't easy..... but, think positive my dear friend, you deserve much more!!!! Hope that you are okay! I agree with you! Self-esteem is important and you are amazing and fabulous. Never forget that. Your words touch our hearts. Hi Launna, hope you had a nice weekend. Your quotes and words are always so thought provoking and motivating. Hope you have a wonderful week ahead. nice sentences , they all are true! It sounds to me like you've got a strong foothold on the path to recovery, and I'm not a bit surprised!! Go Launna!! woot! I am happy to see you moving forward, it's not always easy to let go of what was or what we thought we wanted in life. Trust me I know that first hand of all people. I think this is a wonderful read and I am so proud of you for moving forward. You will find the right man and he is gonna knock your socks off, I just know it and you will knock his off as well. You should never settle, Launna! You deserve everything the best, never forget it! these are all such an inspiring quotes Launna! thanks for sharing! all the best for us! Ciao Launna, have a lovely day!!! Yourself will fix your heart. A lot of hugs!! You are so right! You will find someone, probably when you are least expecting it! I love being active and it is important to find someone who will enjoy doing things with you. You may need to find someone a little younger than you. My husband is almost 5 years younger than me, but it has worked out very well. Just don't give up!! !